The ‘Aria with diverse variations’, Bach’s own title for his unprecedented ‘Goldberg Variations’, was written in 1742 for (Count) Herman Karl von Kayserling (1696–1764), the Russian ambassador in Dresden. It was catalogued BWV988 by Wolfgang Schmieder and first published by Balthasar and Schmid in Nürnberg. These variations became the fourth part of a keyboard grand design, Bach’s Klavierubüng. The collective title was borrowed from his Leipzig predecessor Johann Kuhnau and its remaining components comprised: part I, the six Partitas (1731); part II, including the ‘Italian Concerto’; and a third part (largely for organ) embracing the ‘St Anne’ Fugue and his ‘Giant’ Fugue based on the chorale ‘Wir glauben alle an einen Gott’. Johann Sebastian was presented to the Count following a concert of 1736 at the organ of Frauenkirche in Dresden. Thereupon Kayserling helped appoint Bach as ‘composer to the Saxon Court’. The Count had also become mentor to Danzig teenage keyboard virtuoso Johann Gottlieb (Theophilus) Goldberg, a pupil of Bach’s eldest son, William Friedemann. Bach’s biographer, Johann Nikolaus Forkel wrote the first exhaustive text on the composer (published 1802) and he describes circumstances in which the ‘Aria and 30 Variations’ were envisioned: ‘The Count once said to Bach that he should like to have some pieces for his Goldberg which should be of such soft and somewhat lively character that he might be cheered up by them in his sleepless nights.’ Forkel goes on to say that Kayserling was so impressed with the Variations that he rewarded Bach with a golden goblet containing 100 louis d’or. Many academics contend from this that the work was commissioned. Others say the evidence is inconclusive. A contemporary document, ascribed to one Johann Elias Bach (1705–1755), a son of J S Bach’s eldest cousin, describes an event of 1741 at which the composer played the entire work while demonstrating a new harpsichord for Kayserling and a group of dinner guests. His ‘Air and 30 Variations’ were still with the publisher, though, when the Count expressed conspicuous delight Bach assured him that the moment his manuscript became available Kayserling would certainly receive a copy; hardly a likely scenario if the work had been commissioned. There is certainly no formal dedication in the original edition. Within J E Bach’s same account we also find doubts about authorship of the work’s richly ornate opening Aria. Bach’s second wife, Anna Magdalena, supposedly played it at her harpsichord as Johann Sebastian taught at Saint Thomas. And sometime earlier he had jotted it down in his ‘Notenbüchlein’. The more indisputable wisdom suggests that this 32-bar sarabande appeared in Anna Magdalena’s own notebook as early as 1725. Whatever its origins, they have little bearing on the consequent nature of Bach’s Variations. Of far greater importance is how the structural form and design of the entire work proceeds from this Aria, though not from the melody but its accompanying 32-bar bass and harmony. In fact the only change in harmony is from major to minor, variations in the latter mode strategically placed to heighten variety. Cadences in D major (bar 16), E minor (bar 24) and G major (bar 32) distinguish the tonal path of the theme, and emerge in all variations except for those in the tonic minor (Nos 15, 21 and 25). And here E flat major replaces E minor at bar 24. The earliest extant variations appeared before the mid-sixteenth-century. Spanish composer Antonio de Cabezón (c1510–1566) elaborated on a originating theme in his ‘Obras’, while Englishman Hugh Ashton (d1522) was thought to be the composer of ‘My Lady Carey’s Dompe’, a set of variations on a ground bass. Danish organist Dietrich Buxtehude (1637–1707) most probably wrote 32 variations titled ‘La Capricciosa’, taking as his Aria the song ‘Kraut und Rüben haben mich vertrieben’. This latter melody turns up in Bach’s Quodlibet (Variation 30), though the link may have occured by chance. It is interesting to speculate on how familiar Bach was with parallel works, but we have no compelling evidence to confirm that he knew the forward-looking Buxtehude creation. In any event Bach’s monumental invention is arranged so that every third variation is a canonic one, ending with the Quodlibet based on two popular contemporary tunes. The first canon becomes Variation 3, the last Variation 27. In rounding off his structure Johann Sebastian may have recalled the annual Bach family reunions when quodlibets were frequently sung. Between each third Variation comes a duet, usually extrovert in nature, and a three-part invention or fugue. It follows that the work has nine canons; the first composed on the minor and successive canons built on a larger interval. The two central canons, at the fourth and the fifth are inverted; the final canon, at the ninth, has its own bass and no third voice. Yet frequently the two canonic parts appear alongside a bass obligato and a three-voice variation results. Intervening variations are contrapuntally complex though they share the same harmonic framework. Those preceding each canon are largely rapid toccatas. The non-canonic variations also include fughettas plus three and four-part passages. We therefore have a sequence of canons, three-part inventions or fugues and duets. With their monothematic and wholly contrapuntal genesis, the ‘Goldberg Variations’ undoubtedly pave the way for Bach’s final keyboard works—the Musical Offering, ‘Von Himmel hoch’ Variations (BWV769) and The Art of Fugue. The question of repeats has for long been the subject of lively debate. Similarly it has occasioned performances of widely-contrasting length and intellectually diverse standpoints. As LPs flourished, a need to discard many repeats became essential. The demand for single-disc releases (approximately 60 minutes playing time) was a powerful dictat. For performance purposes concert managements were wary of ninety-minute programmes without intermission. There are those who contend that the truest diversity of the Goldberg Variations is only realized by observing all repeats as indicated textually througout the work. In most such performances repeats are performed with significant embellishments. Alternatively the articulation or dynamics may be varied with a new approach to structural relationships and expressive potentialities in each repeated variation. Says Rosen: ‘While it is possible to ornament repeats of dances in the early suites, it is far more difficult to find a varied ornamentation for repeats in the Goldberg Variations that would not seem intrusive, so much do the original ornaments seem an indissoluble part of the conception of the melodic arcs.’ Many performers steer a middle course. In the present recording Tatiana Nikolayeva has chosen to omit repeats in variations 7, 11, 13, 15, 25 and the final Aria. Variation 1 3/4 is a duet with a quaver figure in the left hand, a semiquaver in the right, and the two interchanged. Rosalyn Tureck sees it as ‘an archway’ to the subsequent unfolding of Bach’s vast, expressive structure. With Variation 2 2/4 Bach introduces a delicate three-part cantabile; the upper parts pursuing a imitative dialogue, at variance with the bass line. Variation 3 becomes the first of Bach’s canons; his canon on the unison 12/8. A trio with even-handed upper parts; these voices cross paths and through the bass its harmony is kept in motion. A constant overlapping of entries characterizes the ensuing four-part 3/8 fugal discourse with a sole three-note figure and its inversion. The next, extrovert 3/4 duet called for two keyboards ‘a 1 Clav’ and ‘a 2 Clav’ as Bach originally dictated (Balthasar and Schmid) in his reference to the seperate manuals. A bouyant variation with frequent crossing of hands. Variation 6. At the Canon on the second 3/8 we are on serene territory while upper discords resolve naturally to a third against a striding bass. There follows a thematic duet 6/8; Bach’s sole variation in the manner of a binary gigue; commonly an animated fourth movement of the classical French-style suite. Variation 8—yet another duet 3/4, originally assigned to the second manual. The first pair of statements are eventually inverted. Bach’s ‘Canon in the third’ 4/4 is an essay in consonance with the bass more unconstrained, yet still making regular reference to the original harmony. Variation 10 is a four-part fughetta 2/2. The four-part bass theme reminds us plainly of Bach’s harmonic starting point. More outwardly virtuosic duet writing 2/2 characterizes Variation 11. With the Canon in the fourth 3/4 entries are re-ordered and themes capriciously inverted in the latter half. Here the inversion is as clear and expressive as its original form. Bach must have smiled inwardly at his tacit, jestful approach to the prevailing formal structure. 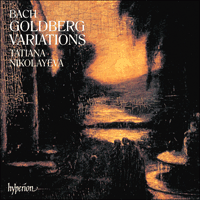 In his embellished aria for Variation 13 Bach proceeds 3/4 with a rich, lyrical upper statement and the lower accompanying voices doubled; its style is ornamental throughout. The 14th Variation is an outgoing duet calling for dazzling fingerwork 3/4. Each of four statements is eventually inverted. With the Canon in the fifth and inversion 2/4 the work has deepened and a more elegiac note appears. This more sober, strongly emotional, chromatic writing finishes not on the conventional tonic, as one might expect, but on the fifth; ascending as one commentator remarks ‘into silence’. Variation 16 is a bold, massive, French-style overture 2/2, still in binary form and generally regarded as Bach’s preparatory nod toward part two of the Aria and Variations. In strict form, as introduced by Lully (1685), the variation opens with dotted rhythms and ends with an accelerated fugue, in this instance the 3-part fughetta 2. A straightforward yet highly complex duet 3/4 forms Variation 17. It is followed by Bach’s Canon in the sixth 2/2. As the canonic parts move in sixths with the pause of a minim, accents of the upper parts are reversed. Resulting suspended discords give variation 18 a distinctive harmonic ‘thumbprint’. The polyphony is further ‘clarified’ and the Variation’s original bass also evident within the canonic lines. In the trio 3/8 of Variation 19 brief figures (quaver and semiquaver) are periodically interchanged as the Variation progresses. Bach’s duets become increasingly virtuosic as Variation 20 demonstrates. This one 3/4 has fast semiquaver triplets in two of its three sets of figures. Canon in the seventh. A gentle, contemplative mood 4/4 is established as the closely-spaced parts succeed one another. Variation No 22 is a four-part fugue 2/2; its guileless motif builds up with inexorable, structural splendour to full, ringing chords. An exuberant, comic duet 3/4 with dashing double third and double sixth figures; Variation 23 includes tongue-in-cheek mordents and sobriety is cast to the winds. Canon in the octave 9/8. This rural theme and answer proceeds with an aura of timelessness, while the melody moves to adjacent notes. Variation 25: this highly charged G minor Variation 3/4 is a powerful, profoundly tragic utterance. A further embellished aria: the brilliant, chromatic bass structure and the unusually specific treble melody interact with unsettling intensity, almost threatening tonal stability. Bach combines both duet and trio 3/4 in his 26th Variation. A two-part Sarabande is woven around with coursing triplet figurations. Here, with the final Canon in the ninth 6/8 the bass is silent; the mood relaxed. Both No 28 3/4 and the following Variation anticipate the work’s conclusion. Here the part-writing is supplanted in part by complex two-part embellishments. Karl Geiringer notes that this Variation and No 29 appear to anticipate a nineteenth-century style of keyboard writing. With the penultimate Variation excitement is further heightened in chord sequences and fleet-fingered one-part passages. Variation 30. At this point we might reasonably expect to discover a canon at the 10th. Instead Bach confounds and delights with his Quodlibet, a divertissement on popular tunes, rounding off the work in a genuine mood of humour and congeniality. It recalls the social fun enjoyed by the Bach family and their friends. The principal quodlibet tunes are German folksongs: ‘I have not been with you for so long’ and ‘Cabbage (Kraut) and turnips (Ruben) have driven me away’. The German saying ‘Durcheinander wie Kraut und Rüben’ can also mean ‘in complete confusion’ and some commentators believe this more idiomatic translation is clear evidence of Bach’s own (intentional) hearty laughter when recollecting the complexity of all that precedes his quodlibet. Beneath the fugal treatment of these folk tunes Bach returns to his original bass. In doing so he leads listeners back to that generating Aria, the life source from whence these encompassing Variations stemmed and to which they now return. Finally, via immeasurable complexities, their wellspring is enhanced and re-invested with a profound, affirmative sense of renewal. For many listeners these closing sequences are the work’s most surpassing. L’«Aria avec variations diverses», titre que Bach avait donné à ses «Variations Goldberg»—formule sans précédent—fut composée en 1742 pour le Comte Herman Karl von Kayserling (1696–1764), Ambassadeur de Russie à Dresde. Elle fut cataloguée BWV988 par Wolfgang Schmieder et publiée pour la première fois par Balthasar et Schmid à Nuremberg. Ces variations devinrent la quatrième partie d’un grand projet pour le clavier, le Klavierübung de Bach. Le titre collectif était emprunté à son prédécesseur à Leipzig, Johann Kuhnau et l’ensemble comprenait en outre: Ie partie, les six Partitas (1731), IIe partie, avec le «Concerto italien», et une troisième partie (surtout pour orgue) avec la Fugue «de St Anne» et la Fugue «géante» basée sur le choral «Wir glauben alle an einen Gott». Johann Sebastian avait été présenté au Comte à la suite d’un concert en 1736 à l’orgue de Frauenkirche à Dresde. Kayserling contribua ensuite à faire nommer Bach comme «compositeur de la Cour de Saxe». Le Comte était aussi devenu le protecteur d’un adolescent de Danzig, virtuose du clavier, Johann Gottlieg (Theophilus) Goldberg, élève du fils aîné de Bach, Wilhelm Friedemann. Le biographe de Bach, Johann Nikolaus Forkel, écrivit la première étude approfondie sur le compositeur (publiée en 1802) et il a décrit les circonstances de la conception de l’«Aria et 30 Variations»: «Le Comte dit un jour à Bach qu’il aimerait avoir quelques morceaux pour Goldberg d’un caractère doux et joyeux pour le réconforter pendant ses insomnies nocturnes.» Forkel ajoute que Kayserling fut tellement impressionné par les Variations qu’il récompensa Bach par le don d’une coupe d’or remplie de 100 louis d’or. De nombreux érudits en ont déduit que l’œuvre était une commande. D’autres trouvent le témoignage peu concluant. Un document contemporain, attribué à un certain Johann Elias Bach (1705–1755), fils du cousin aîné de Bach, décrit un évènement de 1741 au cours duquel le compositeur aurait joué une œuvre entière pour essayer un nouveau clavecin pour Kayserling et un groupe d’invités. Son «Aria et 30 Variations», cependant, était encore chez l’éditeur et lorsque le Comte exprima son ravissement évident, Bach l’assura que dès que le manuscrit serait prêt, Kayserling en recevrait certainement un exemplaire; cela ne semble pas très vraisemblable si l’œuvre était commandée. Il n’y a certainement pas de dédicace officielle dans l’édition originale. Ce même récit de J E Bach suscite aussi des doutes au sujet de l’auteur de l’Air richement orné du début. La seconde femme de Bach, Anna Magdalena, l’aurait joué au clavecin lorsque Johann Sebastian enseignait à St Thomas. Et quelque temps auparavant, il l’avait noté dans son Notenbüchlein. Il est plus sage de supposer que cette sarabande de 32 mesures figurait dans le carnet d’Anna Magdalena dès 1725. Quelles que soient ses origines, elles ont peu de rapport avec la nature des variations de Bach qui suivent. Ce qui est beaucoup plus important, c’est que la structure et le dessin de toute l’œuvre découle de cette Aria, non pas de la mélodie, mais de sa basse d’accompagnement de 32 mesures et de l’harmonie. En fait, le seul changement harmonique est du majeur au mineur, et les variations en mineur sont placées de façon stratégique pour varier les effets. Des cadences en ré majeur (mesure 16), mi mineur (mesure 24) et sol majeur (mesure 32) caractérisent le cheminement tonal du thème et reparaissent dans toutes les variations sauf celles dans la tonique mineure (Nos 15, 21 et 25). Et mi bémol majeur remplace mi mineur à la mesure 24. Les premières variations qui aient survécu parurent avant la moitié du XVIe siècle. Le compositeur espagnol Antonio de Cabezón (vers 1510–1566) broda sur un thème originaire dans ses «Obras» et l’Anglais Hugh Ashton (m.1522) serait l’auteur de «My Lady Carey’s Dompe», série de variations sur une basse obstinée. L’organiste danois Dietrich Buxtehude (1637–1707) composa probablement 32 variations intitulées «La Capriciosa», prenant comme Aria la chanson «Kraut und Rüben haben mich vertrieben». Cette dernière mélodie reparaît dans le Quodlibet de Bach (Variation 30), mais c’est peut-être un hasard. Il est intéressant de se demander si Bach était familier avec des œuvres parallèles, mais nous n’avons aucune preuve concluante confirmant qu’il connaissait la création avant-coureur de Buxtehude. En tout cas, la création monumentale de Bach est organisée de façon à ce que la dernière de chaque groupe de trois variations soit en canon, terminant avec le Quodlibet basé sur deux mélodies contemporaines. Le premier canon devient la Variation 3, le dernier, la Variation 27. En composant sa conclusion, Johann Sebastian pensait peut-être aux réunions annuelles de la famille Bach où l’on chantait souvent des quodlibets. Entre les variations en canon, il y a un duo, généralement exubérant, et une invention ou fugue à trois voix. L’œuvre comprend donc neuf canons; le premier composé dans le mineur relatif et les canons suivants construits avec des intervalles plus larges. Les deux canons du milieu, à la quarte et à la quinte, sont invertis; le dernier canon, à la neuvième, a sa propre basse et pas de troisième voix. Mais souvent les deux parties en canon cotoient une basse obligato et il en résulte une variation à trois voix. Les variations intermédiaires ont un contrepoint complexe bien qu’elles partagent la même construction harmonique. Celles qui précèdent chaque canon sont le plus souvent des toccatas rapides. Les variations non-canoniques comprennent aussi des fughettas et des passages à trois ou quatre voix. Nous avons donc une séquence de canons, d’inventions à trois voix ou de fugues et duos. Avec leur genèse monothématique et entièrement contrapuntique, les Variations Goldberg préparent évidemment la voie pour les dernières œuvres pour clavier de Bach—l’Offrande musicale, les Variations «Von Himmel hoch» (BWV769) et l’Art de la Fugue. La question des reprises provoque depuis longtemps des débats animés. Et elle a causé des exécutions de longueur très variée et de points de vue intellectuels divergents. Avec l’arrivée des microsillons, il devint essentiel d’abandonner beaucoup de reprises. La demande pour des enregistrements sur disque unique (60 minutes environ de durée) était un impératif puissant. Pour les exécutions en concert, la direction des salles hésitait à l’idée de programmes de quatre-vingt-dix minutes sans interruption. Certains maintiennent que la diversité réelle des Variations Goldberg ne se manifeste qu’en respectant toutes les reprises telles qu’elles sont indiquées textuellement dans l’œuvre. Dans la plupart des interprétations de ce genre, les reprises sont exécutées avec l’addition d’ornements. Ou bien, l’articulation ou la dynamique est variée avec une conception différente des relations structurales et des possibilités d’expression dans chaque variation répétée. Beaucoup d’interprètes adoptent un compromis. Dans cet enregistrement, Tatiana Nicolaieva a choisi d’omettre les reprises dans les variations 7, 11, 13, 15, 25 et dans l’Air final. La Variation 1 3/4 est un duo avec un motif de croches à la main gauche, de doubles croches à la droite, qui changent de place. Rosalyn Tureck considère que c’est «une voûte d’entrée» au développement qui suit de la vaste structure expressive de Bach. Avec la Variation 2 2/4, Bach introduit un cantabile délicat à trois voix; les parties supérieures poursuivent un dialogue d’imitation différent de la mélodie de basse. La Variation 3 est le premier des canons: celui sur l’unisson 12/8. C’est un trio avec des voix supérieures égales; ces voix s’entrecroisent et c’est la basse qui maintient le mouvement de l’harmonie. Un chevauchement constant des entrées caractérise la fugue à quatre voix 3/8 qui suit avec un unique motif de trois notes et son inversion. Le duo exubérant 3/4 qui suit demandait deux claviers—«Clav 1» et «Clav 2», comme Bach l’avait dicté à l’origine (Balthasar et Schmid) dans sa référence aux claviers séparés. C’est une variation enjouée avec de fréquents croisements de mains. Le canon sur la seconde 3/8 nous amène dans un domaine serein alors que des discordances dans l’aigu se résolvent naturellement en une tierce sur une basse qui avance à grands pas. Un duo thématique suit 6/8; c’est la seule variation de Bach à la manière d’une gigue binaire; généralement c’est le quatrième mouvement animé de la suite française classique. Puis un autre duo 3/4, destiné à l’origine au second clavier. Les deux premières expositions sont ensuite inversées. Le «Canon sur la Tierce» 4/4 est une expérience de consonance avec une basse plus libre, mais revenant de temps en temps à l’harmonie originale. La Variation 10 est une fughetta à quatre voix 2/2. Le thème à quatre voix de la basse nous rappelle clairement le point de départ harmonique de Bach. Un duo de virtuosité plus évidente 2/2 caractérise la Variation 11. Pour le Canon à la quarte 3/4, les entrées sont réorganisées et les thèmes invertis de façon capricieuse dans la deuxième moitié. Ici, l’inversion est aussi claire et expressive que sa forme originale. Bach devait sourire intérieurement en se rapprochant tacitement et comme par jeu de la structure formelle prédominante. Dans son air enjolivé pour la Variation 13 3/4, Bach produit une exposition d’un riche lyrisme dans l’aigu et les voix d’accompagnement de basse sont doublées; le style est orné pendant tout le morceau. La 14e variation est un duo exubérant qui demande un jeu éblouissant 3/4. Chacune des quatre expositions est ensuite inversée. Avec le Canon en quinte et son inversion 2/4, l’œuvre devient plus profonde et une note élégiaque fait son apparition. Ce morceau chromatique plus sobre, plein d’émotion, s’achève non sur la tonique conventionnelle comme on pourrait s’y attendre, mais sur la quinte; s’élevant, comme un critique l’a fait remarquer, «vers le silence». La Variation 16 est une ouverture de style français 2/2, hardie et massive, encore de forme binaire et généralement considérée comme une allusion préparatoire de Bach à la deuxième partie de l’Air et Variations. De forme stricte, telle que Lully l’avait introduite (1685), la variation commence par des rythmes pointés et s’achève sur une fugue accélérée, dans ce cas, la fughetta 2 à trois voix. Un duo direct, mais très complexe 3/4, forme la Variation 17. Elle est suivie par le Canon sur la sixième 2/2. Comme les voix du canon avancent en sixièmes avec une demi-pause, les accents des parties supérieures sont inversés. Il en résulte des dissonances produites par des retards qui donnent à la Variation 18 une estampille harmonique particulière. La polyphonie est encore «clarifiée» et la basse originale de la Variation ressort de la mélodie du canon. Dans le trio 3/8 de la Variation 19, de brefs motifs (croche et double croche) changent de place de temps en temps au cours du morceau. Les duos de Bach sont d’une virtuosité croissante, comme la Variation 20 le démontre. Celui-ci 3/4 a des triolets rapides en doubles croches dans deux de ses trois séries de motifs. Canon en septième. Une atmosphère douce et contemplative 4/4 s’établit à mesure que les parties rapprochées se succèdent. La Variation 22 est une fugue à quatre voix; son motif naïf se développe avec une splendeur structurale inexorable pour aboutir à des accords retentissants. Un duo comique et exubérant 3/4 avec des motifs impétueux en doubles tierces et doubles sixièmes; la Variation 23 comprend des mordants ironiques et toute retenue est abandonnée. Canon à l’octave 9/8. Ce thème bucolique et sa réponse se développent dans une atmosphère intemporelle tandis que la mélodie passe aux notes voisines. Variation 25: cette Variation en sol mineur 3/4 pleine d’émotion est une déclaration profondément tragique. Un air encore plus orné: la brillante structure chromatique de la basse et la mélodie aiguë très différenciée se répondent avec une intensité troublante, qui semble presque mettre en question la stabilité tonale. Bach combine un duo et un trio 3/4 dans sa 26e Variation. Une Sarabande à deux voix est entrelacée de triolets qui se poursuivent. Dans le dernier Canon en neuvième 6/8, la basse se tait, l’atmosphère est détendue. Le No 28 et la Variation suivante anticipent la conclusion de l’œuvre. L’écriture à plusieurs voix est remplacée en partie par de complexes ornements doubles. Karl Geiringer fait remarquer que cette Variation et le No 29 semblent anticiper un style du XIXe siècle pour le clavier. Dans l’avant-dernière Variation, la tension monte avec des séries d’accords et des passages de virtuosité rapide à une voix. Variation 30. Nous pourrions nous attendre à trouver ici un canon en dixièmes. Mais Bach nous surprend et nous ravit avec son Quodlibet, divertissement sur des mélodies populaires, qui termine l’œuvre dans une atmosphère d’humour et de bonne humeur. Cela rappelle les joyeuses réunions de la famille Bach et de ses amis. Les principales mélodies du quodlibet sont des chansons folkloriques allemandes: «Il y a longtemps que je n’ai pas été avec toi» et «Les choux (Kraut) et les navets (Rüben) m’ont fait fuir». En allemand, l’expression «Durcheinander wie Kraut und Rüben» peut aussi signifier «la confusion la plus complète» et certains critiques pensent que cette traduction plus idiomatique montre bien que Bach riait de bon cœur en évoquant la complexité de tout ce qui précède son quodlibet. En dessous du traitement fugué de ces mélodies folkloriques, Bach reprend sa basse originale. Et il ramène ainsi l’auditeur à cette Aria génératrice, la source vive d’où ont jailli toutes ces Variations qui l’entourent et à laquelle elles reviennent maintenant. Enfin, en passant par des complexités extraordinaires, cette source est rehaussée et investie d’un sens profond de renouvellement et d’affirmation. Pour beaucoup d’auditeurs, ces séquences finales sont celles où l’œuvre se dépasse. Die „Aria mit verschiedenen Veränderungen“, Bachs eigene Bezeichnung für seine beispiellosen „Goldberg-Variationen“ wurde 1742 für Graf Hermann Karl von Kayserlingk (1696–1764), dem russischen Gesandten in Dresden, geschrieben. In Wolfgang Schmieders Verzeichnis der musikalischen Werke Bachs erhielt sie die Bezeichnung BWV988 und wurde zuerst von Balthasar und Schmid in Nürnberg veröffentlicht. Diese Variationen bildeten den vierten Teil eines großen Tastaturwerkes, Bachs Clavierübung. Diesen Sammeltitel übernahm Bach von seinem Leipziger Vorgänger Johann Kuhnau, und die übrigen Bestandteile waren Teil I, die sechs Partitas (1731), Teil II mit dem „Italienischen Concerto“ und einem dritten Teil (vornehmlich für Orgel) mit der „Sankt-Anna-Fuge“ und seiner „Riesenfuge“, die auf dem Choral „Wir glauben alle an einen Gott“ beruht. Johann Sebastian Bach wurde dem Grafen im Anschluß an ein Konzert im Jahre 1746 auf der Orgel der Frauenkirche in Dresden vorgestellt. Daraufhin wirkte Kayserlingk bei der Ernennung Bachs als „Komponist am sächsischen Hof“ mit. Der Graf war gleichzeitig der geistige Ratgeber des vierzehnjährigen Danziger Klaviervirtuosen Johann Gottlieb (Theophilus) Goldberg geworden, einem Schüler des ältesten Sohnes Bachs, Wilhelm Friedemann. In seiner Bach-Biographie schrieb Johann Nikolaus Forkel die erste Abhandlung über den Komponisten und schilderte die Umstände, unter denen die „Aria mit 30 Variationen“ ins Auge gefaßt worden war. „Der Graf sagte einmal zu Bach, daß er gerne einige Stücke für seinen Goldberg hätte, die so sanften und munteren Charakters wären, daß er dadurch in seinen schlaflosen Nächten aufgeheitert werden könnte.“ Forkel erzählt weiterhin, daß Kayserlingk so von den Variationen begeistert war, daß er Bach mit einem goldenen Becher belohnte, der mit 100 Louisdor gefüllt war. Aufgrund dieser Geschichte sind viele Musikologen der Meinung, das Werk sei in Auftrag gegeben worden. Andere wiederum behaupten, dies mangelte an Beweiskraft. In einem zeitgenössischen Schriftstück, das einem Sohn des ältesten Vetters Bachs, Johann Elias Bach (1705–1755), zugeschrieben wird, wird ein Ereignis geschildet, bei dem der Komponist das gesamte Werk spielte, als er Graf Kayserlingk und einer Gruppe Gästen ein neues Cembalo vorführte. Seine „Aria mit 30 Variationen“ war von dem Verleger noch nicht herausgegeben worden. Der Graf war von diesem Werk jedoch eindeutig so angetan, daß Bach versprach, ihm nach der Veröffentlichung sofort eine Kopie zukommen zu lassen—kaum wäre dies der Fall gewesen, hätte der Graf das Werk in Auftrag gegeben. Feststeht auch, daß die Originalausgabe keinerlei Widmung enthielt. In demselben Schriftstück Johann Elias Bachs treten auch Zweifel mit Bezug auf die Urheberschaft der reich verzierten Eröffnungsaria des Werkes auf. Anna Magdalena Bach, zweite Frau des Komponisten, soll sie auf ihrem Cembalo gespielt haben, als Johann Sebastian an Sankt Thomas lehrte und er hatte sie sich eine kurze Zeit vorher in seinem Notenbüchlein aufgeschrieben. Weniger umstritten ist die Kenntnis, daß diese Sarabande mit 32 Takten schon 1725 im Notenbüchlein der Anna Magdalena Bach erschienen war. Allerdings hat der Ursprung der Aria keinen Einfluß auf den eigentlichen Charakter der Bach-Variationen. Viel bedeutender ist, wie sich die strukturelle Form und Gestalt des ganzen Werkes aus dieser Aria ergibt und zwar nicht aus ihrer Melodie, sondern aus der Begleitung durch Baß und 32 Takten Harmoniefolge. Tatsächlich besteht der einzige Harmoniewechsel aus dem Übergang von Dur zu Moll, wobei die Variationen der letzteren Tonart aus strategischen Gründen an gewissen Stellen angeordnet sind. Die Kadenzen in D-Dur (16. Takt), e-moll (24. Takt) und G-Dur (32. Takt) unterscheiden den Klangweg des Themas und erscheinen außer in denen der gleichnamigen Moll-Tonart (Nrn. 15, 21 und 25) in allen Variationen. In diesen Nummern wird im 24. Takt e-moll durch Es-Dur ersetzt. Die frühesten, noch existierenden Variationen erschienen vor Mitte des sechzehnten Jahrhunderts. Der spanische Komponist Antonio de Cabezón (circa 1510–1566) entwickelte in seinen „Obras“ ein Einführungsthema, und von dem Engländer Hugh Ashton (gest. 1522) wird angenommen, daß er „My Lady Carey’s Dompe“ komponierte, einem Satz von Variationen über einen Grund­baß. Der Organist Dietrich Buxtehude (1637–1707) schrieb wahrscheinlich 32 Variation mit dem Titel „La Capriciosa“, in denen er als seine Aria das Lied „Kraut und Rüben haben mich vertrieben“ nahm. Die letztgenannte Melodie taucht in Bachs Quodlibet (Variation Nr. 30) wieder auf, allerdings kann diese Verbindung reiner Zufall sein. Spekulationen zu Bachs Bekanntschaft mit parallel erscheinenden Werken sind zwar sehr interessant, jedoch liegt kein eindeutiger Beweis vor, daß er die vorausschauende Kreation Buxtehudes kannte. Bachs gewaltiges Werk ist so angelegt, daß jede dritte Variation aus einem Kanon besteht und mit einem Quodlibet aus der Verbindung zweier zeitgenössischer Gassenhauer endet. Der erste Kanon wird zur 3. Variation, der letzte die Variation Nr. 27. Bei der Abrundung seiner Konstruktion hat Johann Sebastian vielleicht die alljährliche Zusammenkunft der Familie Bach vor Augen gehabt, bei der häufig Quodlibets gesungen wurden. Zwischen jeder dritten Variation liegt ein Duett, meist von extravertierter Natur, und eine dreiteilige Invention oder Fuge. Daraus ergibt sich, daß das Werk aus neun Kanons besteht; der erste im Einklang komponiert und die folgenden Kanons auf einem größeren Intervall aufbauend. Die beiden mittleren Kanons in der Quarte und Quinte werden umgekehrt; der letzte Kanon in der None besitzt seinen eigenen Baß und keine dritte Stimme. Jedoch erscheinen die beiden Kanonteile häufig in Begleitung eines Baßobligats und es ergibt sich eine dreistimmige Variation. Die dazwischenliegenden Variationen sind von kontrapunktischer Vielschichtigkeit, obwohl sie den gleichen harmonischen Rahmen gemeinsam haben. Die jedem Kanon vorangehenden Variationen sind im allgemeinen hurtige Toccatas. Die nichtkanonartigen Variationen enthalten dazu noch Fughettas und drei- und vierstimmige Passagen. Das Werk setzt sich also aus einer Reihenfolge von Kanons, dreiteiligen Inventionen oder Fugen und Duetts zusammen. Mit ihrer monothematischen und gänzlich kontrapunktischen Entwicklung ebnen die Goldberg-Variationen zweifellos den Weg für Bachs spätere Klavierwerke—das Musikalische Opfer, die Variationen über „Vom Himmel hoch“ (BWV769) und Die Kunst der Fuge. Die Frage der Wiederholungen war schon lange das Thema hitziger Debatten. Gleichermaßen veranlaßte sie Vorführungen von sehr unterschiedlicher Länge und intellektuell gegensätzlichem Standpunkt. In der Blütezeit der Langspielplatte war die Streichung vieler Wiederholungen unbedingt erforderlich. Die Forderung nach einplattigen Ausgaben (Spielzeit ungefähr 60 Minuten) war ein kräftiges Diktat. Aus Vorführungsgründen waren die Konzertveranstalter der 90 Minuten langen Programme ohne Unterbrechung überdrüssig geworden. Natürlich vertreten viele die Meinung, daß die echte Mannigfaltigkeit der Goldberg-Variationen nur durch Beachtung aller im Text des Gesamtwerkes angegebenen Wiederholungen verwirklicht werden kann. In den meisten dieser Konzerte werden die Wiederholungen mit bedeutenden Ausschmückungen vorgetragen. Andererseits können Lautbildung oder Dynamik durch neue strukturelle Verbindungen und ausdrucksvolle Möglichkeiten in jeder wiederholten Variation verändert werden. Viele Künstler verfolgen einen Mittelweg und in der vorliegenden Aufnahme hat sich Tatiana Nikolayeva dazu entschlossen, die Wiederholungen in den Variationen 7, 11, 13, 15, 25 und der Schlußaria auszulassen. Die 1. Variation besteht aus einem Duett mit Achtelnoten in der linken Hand, Sechzehnteln in der rechten und dem Vertauschen dieser beiden Figuren. Rosalyn Tureck empfindet dies als einen „Torbogen“ für die anschließende Entfaltung der umfangreichen, ausdrucksvollen Konstruktion Bachs. Mit Variation Nr. 2 2/4 stellt Bach ein delikates dreistimmiges Cantabile vor, in dem die oberen Stimmen im Gegensatz zu der Baßlinie einen nachahmenden Dialog abhalten. Variation Nr. 3 bildet den ersten von Bachs Kanons, sein Kanon im Einklang 12/8. Diese Variation bildet ein Trio aus gleichwertigen Oberstimmen; die Wege der Stimmen werden gekreuzt und durch den Baß bleiben ihre Harmonien lebendig. Das ständige Überlagern der Einsätze kennzeichnet die folgende vierstimmige Fuge 3/8 mit einer einzelnen Dreinotenfigur und ihrer Umkehrung. Das nächste, extravertierte Duett 3/4 forderte zwei Tastaturen, „a 1 Clav.“ und „a 2 Clav.“, wie Bach ursprünglich (Balthasar und Schmid) mit Bezug auf die beiden Manuale vorschrieb, und ist eine schwungvolle Variation mit häufigem Überschlagen der Hände. Im Kanon in der Sekunde 3/8 betreten wir friedlichere Gefilde, wobei die oberen Dissonanzen sich gegenüber einer gemächlichen Baßlinie natürlich in eine Terz auflösen. Dann folgt ein thematisches Duett 6/8, Bachs einzige Variation in der Weise einer zweiteiligen Gigue und meist ein lebhafter vierter Satz der klassischen französischen Suite. Ein weiteres Duett 3/4 war ursprünglich für das zweite Manual vorgesehen. Das erste Einführungspaar wird anschließend umgekehrt. Bachs „Kanon in der Terze“ 4/4 ist eine Studie der Konsonanz, wobei der Baß zwangloser erscheint, jedoch die Originalharmonie immer noch regelmäßig aufgreift. Variation Nr. 10 ist eine vierstimmige Fughetta 2/2, deren vierteiliges Baßthema uns unmißverständlich an den harmonischen Ausgangspunkt Bachs erinnert. Eine im allgemeinen kompliziertere Stimmführung 2/2 kennzeichnet die Variation Nr. 11. Bei dem Kanon in der Quart 3/4 werden die Einsätze umorganisiert und die Themen in der letzten Hälfte in kapriziöser Weise umgekehrt. Hier erscheint die Umkehrung so deutlich und ausdrucksvoll wie in ihrer Originalform. Bach hat bei seinem stillschweigenden, scherzhaften Versuch einer vorherrschenden formalen Struktur bestimmt in sich hineingelächelt. In seiner ausgeschmückten Aria für Variation Nr. 13 geht Bach mit einer reichhaltigen, lyrischen Einführung durch die Oberstimme 3/4 und einer Verdoppelung der begleitenden Unterstimmen vor und ihr Stil ist von Anfang bis Ende reich verziert. Die 14. Variation ist ein weiterführendes Duett, das eine virtuose Fingerfertigkeit 3/4 verlangt. Alle der vier Melodien werden anschließend umgekehrt. Mit dem Kanon in der Quinte und der Inversion 2/4 hat sich das Werk vertieft und es erscheint ein eher schwermütiger Ton. Diese ernste, gefühlvolle, chromatische Komposition schließt nicht, wie man erwarten würde, mit dem üblichen Grundakkord ab, sondern mit der Quinte, die, wie jemand einmal bemerkte, „in die Stille aufsteigt“. Variation Nr. 16 ist eine verwegene, umfangreiche Ouvertüre im französischen Stil 2/2, immer noch in der zweiteiligen Form und allgemein als Bachs vorbereitender Hinweis auf den zweiten Teil der Aria und Variationen angesehen. In strenger Form wie von Lully (1685) vorgestellt, beginnt die Variation mit punktierten Rhythmen und endet mit einer beschleunigten Fuge, in diesem Fall der dreiteiligen Fughetta Nr. 2. Ein direktes, jedoch sehr kompliziertes Duett 3/4 bildet die Variation Nr. 17. Diese wird von Bachs Kanon in der Sexte 2/2 gefolgt. Die Kanonstimmen verlaufen in der Sexte mit einer halben Pause und die Akzente der Oberstimmen werden umgekehrt. Die daraus resultierenden schwebenden Dissonanzen versehen die 18. Variation mit einem charakteristischen harmonischen „Fingerabdruck“. Die Mehrstimmigkeit wird weiter „entwirrt“ und die ursprüngliche Baßlinie der Variation tritt in der Kanonmelodie wieder auf. Im Trio 3/8 der 19. Variation werden regelmäßig kurze Figuren aus Achtel- und Sechzehntelnoten miteinander vertauscht. Bachs Duetts werden ständig schwieriger, wie die Variation Nr. 20 verdeutlicht. Zwei der drei Figurensätze besitzen schnelle Sechzehntel-Triolen. Dann folgt der Kanon in der Septe. Eine sanfte, nachdenkliche Stimmung 4/4 wird durch die enge Aufeinanderfolge der Stimmen erreicht. Die Variation Nr. 22 besteht aus einer vierstimmigen Fuge 2/2, deren schlichtes Motiv sich mit unerbittlicher, struktureller Pracht in vollen, strahlenden Akkorden aufbaut. Als sprühendes, humorvolles Duett 3/4 mit flotten Doppelterz- und Doppelsextfiguren enthält die 23. Variation ironische Mordente und alle Mäßigkeit wird in den Wind geschlagen. Das ländliche Thema im Kanon in der Oktave 9/8 und seine Antwort schreitet mit einem Gefühl der Zeitlosigkeit voran, wobei die Melodie auf danebenliegende Noten übergeht. Die inhaltsreiche g-moll-Variation Nr. 25 ist eine mächtige, ungemein tragische Äußerung. In der weiter verzierten Aria wirken die großartige chromatische Baßstruktur und die ungewöhnlich markante Sopranmelodie mit beunruhigender Intensität, fast drohender Tonstabilität aufeinander ein. Bach kombiniert in seiner 26. Variation das Duett mit einem Trio 3/4. Eine zweiteilige Sarabande wird mit fließenden Triolfigurationen umwebt. Hier im letzen Kanon in der None 6/8 ist der Baß still—die Stimmung ruhig. Sowohl Nr. 28 als auch die folgende Variation bereiten sich auf den Abschluß des Werkes vor. Die Stimmführung wird hier zum Teil durch komplizierte, zweistimmige Verzierungen abgelöst. Karl Geiringer bemerkt, daß diese Variation sowie die Nr. 29 die Klavierkompositionen des neunzehnten Jahrhunderts antizipieren. In der vorletzten Variation wird die Spannung in Akkordreihen und schnellfingrigen einstimmigen Passagen noch weiter erhöht. Variation Nr. 30. An dieser Stelle läßt sich logischerweise ein zehnter Kanon erwarten. Bach jedoch setzt an seine Stelle ein reizendes Quodlibet, ein Divertimento aus bekannten Melodien, durch die das Werk mit aufrichtiger Freude und Zuträglichkeit abgerundet wird. Es erinnert an den Spaß, den die Familie Bach und ihre Freunden zusammen hatten. Die Hauptthemen des Quodlibets beruhen auf deutschen Volksliedern: „Ich war solange nicht bei dir“ und „Kraut und Rüben haben mich vertrieben“. Das bekannte „Durcheinander von Kraut und Rüben“ veranlaßte eine Reihe von Musikologen zu der Ansicht, daß Bach sich über die Komplexität und Schwierigkeit des gesamten Werkes, die seinem Quodlibet vorangegangen sind, köstlich amüsiert hat. Mit der Fugenbehandlung dieser Gassenhauer kehrt Bach zur ursprünglichen Baßmelodie zurück. Dabei führt er den Zuhörer wieder auf die Urgestalt seiner Aria hin, dem Lebensborn, aus dem diese umfassenden Variationen entsprangen und zu der sie jetzt zurückkehren. Zum Abschluß wird ihr Urquell mit unermeßlicher Vielschichtigkeit verschönert und mit einem tiefgehenden, bejahenden Gefühl der Erneuerung wieder eingeführt. Für viele Zuhörer sind die Schlußphrasen die herrlichsten des ganzen Werkes.